Happy Monday to you!! Our heat wave has finally broke a little and I am sitting outside on my deck enjoying a cup of coffee while I write this! Gotta love it! 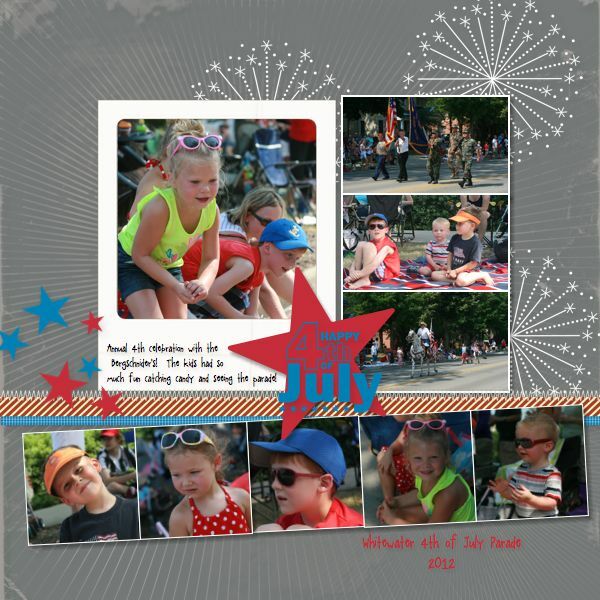 It was unfortunately one of those 100+ degree days when we took the kids to the 4th of July Parade this year. We did manage to survive by finding a shade tree to sit under and we had lots of cold water. The kids had so much fun at the parade that I think they forgot how hot it was! 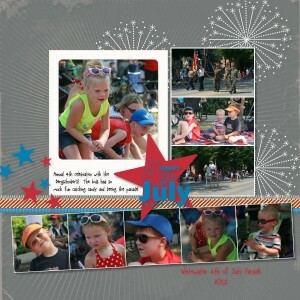 I love the fact that I can get my scrapbooking done SO quickly with My Digital Studio! These pictures were just taken less than a week ago and I already have the page put together. 🙂 Most of the elements from this page came from the July Fourth Stamp Brush Set, which is a DEAL at only $3.95!! I added an overlay from the Decorative Overlays Stamp Brush Set, a few ribbons, and some stitching. I think the most challenging part of this page for me was the layout because I had so many pictures I wanted to scrap.